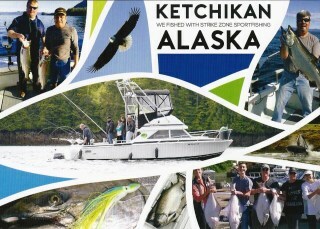 ALASKA STRIKE ZONE SPORTFISHING is a Ketchikan charter fishing excursion company that can accommodate cruise ship guest from cruise lines including Princess Cruises, Holland America, Norwegian Cruise Line, Celebrity, Carnival and Disney. Our Cruise Ship fishing excursions will make the most of your time in port. By booking directly with us, we will save you money and have more time for fishing and viewing the beauty and wildlife, Southeast Alaska has to offer. We book only private charters. You will not be put into a group, your party will have the boat exclusively. Our Half Day Salmon Fishing Charter is a full 4 hours of salmon fishing for $150.00 per person (4 Guests minimum.) You can compare this to the on-board Alaska Cruise Ship price of over $209 per person for the same 4 hour salmon fishing charter run on a tight schedule. If your time in port allows and you would like a few more hours on the water, we recommend our 6 hour Salmon trip at $185.00 per person, this allows you even more time to get into the fish and to see more of Alaska’s wildlife. On either one of our action filled fishing adventures, it is possible to see humpback whales, killer whales, porpoise, sea lions, seals, and more eagles than you can photograph. See Our Salmon and Halibut Charter Rates for details and to take advantage of our “In Season Specials”! To make your reservation or inquire, call our office at 907-247-5663, or email us at fishn@alaskastrikezone.com. You can also book online! Alaska Strike Zone Will Pick You Up! We understand that you are on vacation, so we have eliminated the stress of having to call and wait for a taxi. Our Customer Service Representative will pick your party up right on the dock, relax and enjoy the scenic 20-minute ride north of the City of Ketchikan along the Tongass Narrows, to Knudson Cove Marina. Your driver is a knowledgeable local and offers some insight into Ketchikan’s colorful history and will answer any questions you may have about our city. Considered booking with another charter company? If you book with another charter company that is located out of Knudson Cove Marina or Clover Pass Marina, they will tell you to take a taxi out to them. We understand that our Guests biggest fear is missing the boat back at the end of their trip. 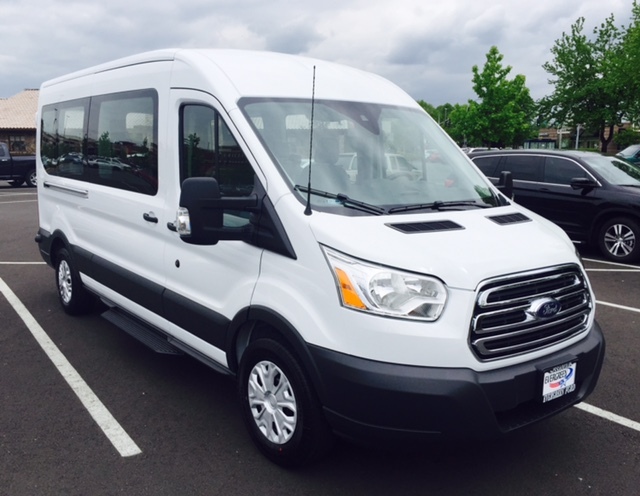 With no control of taxi cabs schedule for pickup/drop off, we decided that adding a van to our fleet makes better customer service. When you book a fishing charter with us, you’ll have the option to add transportation before you check out. We supply all fishing gear, bait, and tackle. We use only top of the line equipment and our boats have the latest electronic gear designed to help find the fish. We serve our Guests a tasty snack of locally smoked salmon and crackers. We also have complimentary coffee, cookies, sodas & bottled water throughout your trip. Clean, dry, top and bottom Grunden Rain Gear is provided for use for your comfort. We have sizes Adult Small-2XL available on your boat. 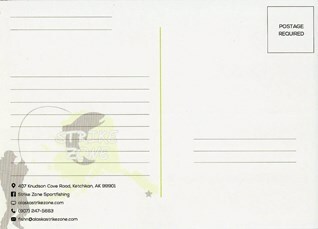 Complimentary Alaska Strike Zone POSTCARD for you to send to your family back home while you are fishing! We will mail it out for you as well. This is our way of saying Thank You for fishing with us! You can purchase your Alaska fishing license and King Salmon stamp on board as we head out to the fishing grounds. Anyone the age of 16+ is required to purchase a 1-day fishing license at cost of $25 per license. If you are salmon fishing in the months of May-July, King Tag’s are $15 each person. Learn more about Alaska Fishing License. Processing of your catch is available dockside from Gateway Smoke House. Your catch will be iced from the time it is caught until it is filleted, vacuumed packed, frozen and boxed. It is then shipped to your door on the day you specify. Shipping is standard overnight FedEx, Monday through Thursday. Processing rates run approximately $9.00 – $12.00 per pound finished weight with everything included, to put your catch in your freezer. For the return trip to the Cruise Ship, your driver will prearrange a time with your Captain to pick your party up that allows for maximum fishing time and to get you back to your ship in a timely manner. If you have extra time in Ketchikan, you can talk to your driver about stopping at Totem Bight State Park, Saxman Native Village Totem Park, or any other local attractions.